It's a unique drive-thru that's always worth the wait in line! The Donut Hole has been in La Puente for many years. 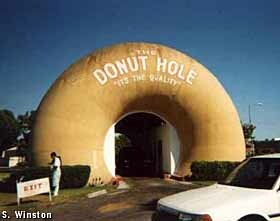 You can literally drive through the donut to get your donuts. It's at 15300 Amar Road, La Puente, CA. John Wayne Statue #2, Santa Ana, CA - 25 mi.